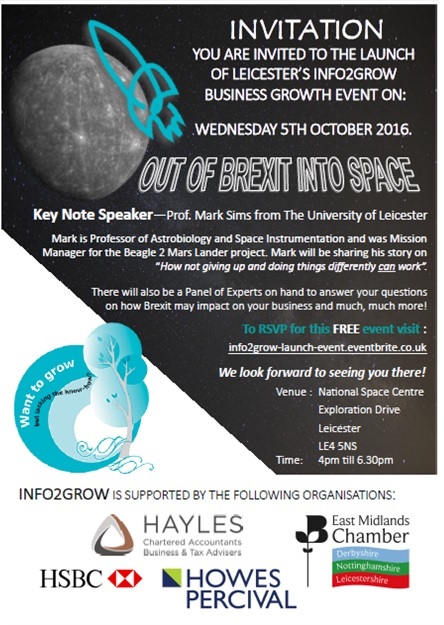 Out of Brexit into Space will provide delegates with practical tips and advice for maximising their business growth potential. The event will also provide a valuable opportunity for networking with like-minded business people around the impact of Brexit, current issues facing businesses and achieving success in the current business environment. Key Note Speaker: Professor Mark Sims, University of Leicester. Mark is Professor of Astrobiology and Space Instrumentation and was Mission Manager for the Beagle 2 Mars Lander project. Mark will be sharing his story on "How not giving up and doing things differently can work." So, if you have any burning questions for the panel, on Brexit or other issues facing your business, please let us have these when you register!